Material science has a simple law, know the importance of each material and add it into the recipe in specific amount. It applies everywhere either you are cooking food or pouring concrete. For cooking the delicious food item you have to add the right portion of required ingredients in recipe. Same as food item, quality concrete mixes should be prepared knowing the importance of all constituents in the concrete. As we all know, cement is a binder material made of 4 base elements lime, silica, alumina and iron oxide, then form clinker to fine powder. It is mainly used as binding material in construction. In contact with water reacts chemically to form cement paste, this reaction is called hydration. Hydration process is slow and takes longer period even after hardening of concrete. In Construction work sand is used as an inert material in the mortar and concrete. It is naturally obtained from the river and water stream beds. Also, sand can be obtained artificially by crushing stone. It helps to reduce the cost of binder material like cement and increase the volume of binding material. It helps to fill up the gap between two jelly blocks and spread the binder. Sand is more important material which helps in preventing shrinkage of binder material i.e. cement. Gravel and stone are the main materials used as jelly or aggregates in concrete mixes. Stone form the granular structure, which make the concrete stronger. Stone can be obtained naturally and artificially using the various techniques such as crushing them using the mechanical equipments. The size of course aggregates should not be greater than 80 mm and less than 4.75 mm as per IS standards. Further, Course aggregates should take approximate 70 to 80% weight of total volume of concrete. Water is an important element which helps cement in hydration process. 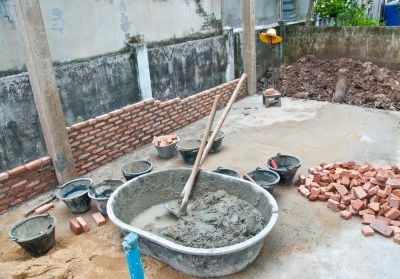 As per the rule of thumb 25 to 30 % of water (by weight) is required to hydrate the cement. Water used in concrete should be free of oil, paint and other chemicals. You can also read more on the importance of water for construction in my previous post. *M stands for mix and numerical value refers to the compressive strength of cement concrete in 28 days.